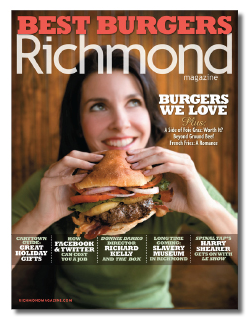 I picked up the November issue of Richmond Magazine purely because of the front cover and tag line. I luv, luv, luv a good hamburger! Currently my favorite burger is from Five Guys Burger and Fries. Ever been there? It’s amazing! I don’t know which I like better, the juicy burger or the fresh fries. But after reading the article about the Best Burger in Richmond, I am up to the challenge of testing out the competition. Here are the contenders: Cafe Gutenberg, Honey Whyte’s, Racine, Delux, The Hill Cafe, Davis and Main, Dot’s Back Inn, River City Diner, Can Can Brasserie, Tarrant’s Cafe and The Belvidere at Broad. You should add The Forest on forest hill ave. If you can get past the smoky atmosphere, the bluecheeseburger is the best in town! ugh, i hope not. 5 guys groases me out! The burgers at Hill Cafe are fabooo! Skinny shoestring fries on the side….mmmmm…. That’s my vote! Good luck to the BBURP panel! can i get in on the dot’s back inn tasting action? in my ‘hood! Hi Totty! Wow, what a small world. So nice that you know the Kidds…they are such a wonderful family. I’ve known Ellen since I was about 12, and we were also college roommates. I sure do miss good old Richmond!!! Glad you found me. 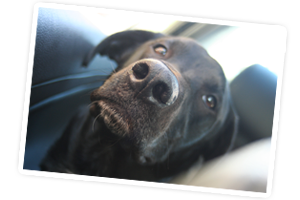 I need a Richmond fix for sure, so it’s nice to now have your blog!! Hope you have a happy Thanksgiving! You should add Caliente – that’s the best burger I’ve had in a long time! What about the Boo? The original home of the pickle ship! Bamboo Cafe! My boyfriend and I have been eating our way through the best burger list too! (Never two in one night though, impressive!) Racine is tops on the list so far so definitely check it out! Good luck and maybe we’ll run into you on a burger night!